Paleontologists discovered, in 2009, the remains of a gigantic snake they named Titanoboa cerrejonensis, in an open-pit coal mine in the Cerrejone Formation in Cerrejone in La Guajira, Colombia. They estimated its weight to be more than a ton and about 13 meters long. The thickest part measured about one meter. 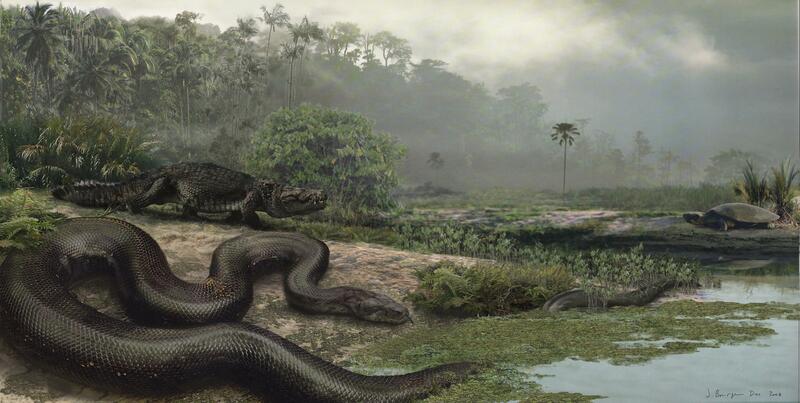 Titanoboa were believed to have lived 60 million years back in the Paleocene epoch. Left: the vertibra of the largest living snake, reticulated python. 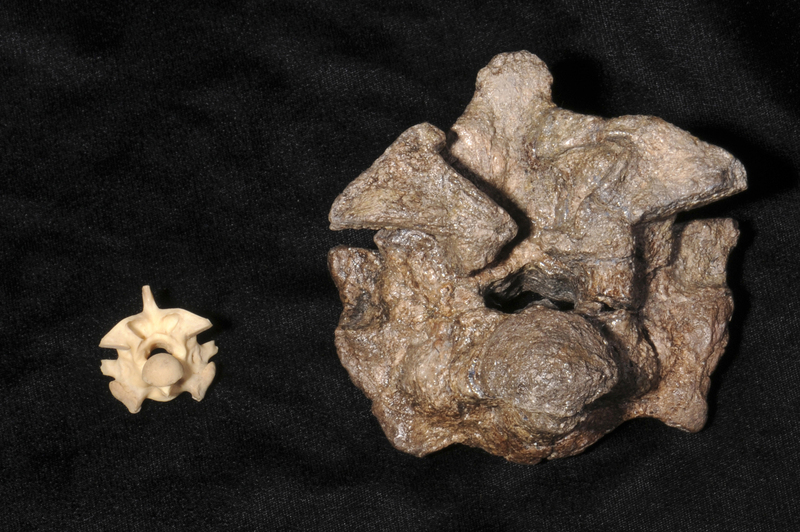 Right: the fossilized vertibra of Titanoboa. Photo Credit – Photo by Ray Carson: UF Photography. Reptiles are cold-blooded vertibrates or poikilothermic, the environment in which they dwelve determines their body temperature and life processes. That is, they grow larger if the surrounding is warmer. This indicated that these gigantic reptiles “Titanoboa cerrejonesis”, meaning titanic boa, lived in an environment where the average daily temperature is about 30-34° C (90° F), which is way above the average temperature of the tropical forests, 24 – 26° C.
An artist’s rendering of Titanoboa in its natural habitat. Credit: Illustration by Jason Bourque/Florida Museum.